Oh my lawd, it’s already Wednesday. My life has been taken over with appointments and late night baseball games. No, I will not tell you which team I am cheering for. Mostly because I don’t cheer for teams, but also because sports teams make people say rude things. Like “I thought you were a great person until I found out you were a _______ fan.” Like, what? That’s probably one of the dumbest things you can say. Same reason I don’t talk about religion or politics on my website. You want someone to get real d*ck head opinionated on ya, talk about sports, Obama or the God you pray to. Not touching it. No way, no how. I have better things to talk about. Like puppies. And new restaurants. Speaking of new restaurants, I’m trying out a few this week. You see, sometimes you get in a rut when it comes to creating recipes. Ok, wait, sometimes I get in a rut. I see other food bloggers who never run out of ideas and I just don’t get it. Because I get in random ruts all the time. And since I came up with around 66 recipes for my latest project in a little over two weeks, I need to find some inspiration. That’s where restaurants come into play. Denver is FULL with awesome restaurants. They are everywhere. Including Boulder. So I’m heading to Boulder today to try out a new paleo restaurant then trying another restaurant tomorrow in the Baker neighborhood. I’m guessing I’ll also be purchasing food somewhere on Halloween. I know that’s a lot of money to spend on food in a week, but I need ideas people. I need some help with flavor combinations or a meat that I haven’t tried cooking myself. Wish me luck. I wish it could stay fall forever here in CO. Since I leave this weekend for Pittsburgh, I’m going to miss another week and a half here in CO. I just know that when I get back, there will probably be snow on the ground. Oh the sadness. I’m ok with snow, especially since we still live in an apartment so we don’t have to shovel, but I’m not really into the whole cold thing. That’s why I buy myself a new winter coat every year. It’s my way of developing a positive reinforcement about living in a snowy state. I don’t think reinforcement is the right word, but you get what I’m going for. A new coat or jacket makes winter worth it. And boots. Obviously. If you saw my instagram post about rearranging my closet, you know I have a brown boot obsession. Ok, I can’t talk anymore, I have restaurants to eat at, baseball games to watch (meaning look at instagram 96% of the time), and political commercials to despise. Is it election day yet so those d*ck head commercials can end?? I swear, those commercials teach children to talk sh*t about each other. Crap, I started talking about politics, I gotta knock that sh*t off. Kbye! Preheat oven to 400 degrees. Grease a 9x12 baking dish. 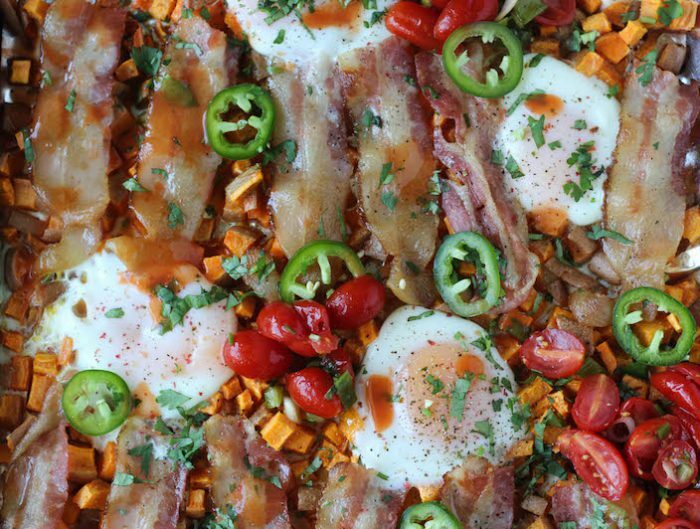 Thinking of making this over the Holidays because who wants to cook breakfast when we are holiday cooking? This way the family has something eat with out disturbing the cook! If you shred the sweet potato, do you still need to pre-bake it? I have left over baked sweet potato…would it work to dice that up instead of dicing and cooking a new one? Do you think this would be good using bacon? I already cooked bacon for a casserole when I found your recipe. Thank you! Denver definitely has some killer restaurants and they just keep popping up everywhere! I’ve given my husband a list a mile long of all the places I want to go. The next ones on my list is Mizuna, Work & Play, and Mercantile in Union Station. I just made myself real hungry. Dang it, my perfectly prepped meal suddenly sounds so lame. Wait. You can make these in a crock pot?! What!?!?!! Tell me more!!! Yes, you can. Layer ingredients. Turn on. Walk away. Easy peasy. And if you have a houseful and the kitchen is busy, you can put the crockpot in any room that has a plug in………out of the way of the real cooking. I didn’t like it cooking overnight….got too well done but I got up about 2:00 and pulled it from the frig and plugged it in and it was perfect at around 6:00…… And the possibilities are endless. I add Daiya peudo cheese sometimes, or other veggies…. Delicious. Hi Julie! I just got back from a trip to Greece and there are so many great flavor combos to try like lemon, oregano, dill with wonderfully flavored foods like lamb, eggplant, fava beans, tomatoes, olive oil, cinnamon. I could see you making a great lemon-chicken soup or a mock spinach pie, moussaka or stuffed grape leaves with lamb. Just some thoughts. Love your blog. “The Flavor Bible” by Karen Page and Andrew Dornenburg is great when in a food rut. Look up one item and it provides a list of spices and other ingredients to create endless flavor profiles! They’ve written several other books that are amazing as well including “What to Drink with What You Eat.” Enjoy! The answer to my prayers! I am in need of a new breakfast I can make ahead, preferably with eggs because they fill me up, and this fits the bill perfectly. Thanks for sharing! Hey Juli! I look forward to hearing what restaurant you try in Baker (we live in that neighborhood). We’re heading to Work & Class this evening. If you’ve never been, it’s amazing! We are trying out Gozo, it’s pretty new but I heard it amazing!! I tried work & class and I thought it was pretty good! You are constantly putting out great recipes, so no worries if you’re in a rut. I don’t see it as a rut! I feel like I’m in one but it’s probably because I haven’t ventured out of my typical foods lately. When all else fails, sweet potatoes with bacon or sausage and something green is delicious! This looks yummy and I love breakfast bakes. This looks amazing! It’s just me and the hubs…will this last okay in the fridge Monday-Friday as we pick away at it? Are you in PA this coming week? I’m in CO for work next week and wanted to drop in to CF Broadway and take one of your classes! Does this reheat well? I love making a breakfast that I can heat up for the week. Also, I’m sorry you will be coming to Pittsburgh, because our forecast is calling for snow! 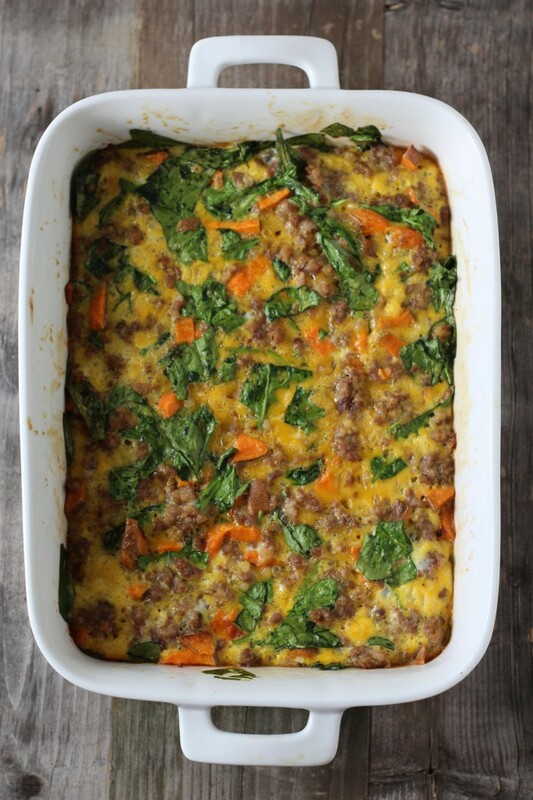 My grandma made her breakfast casserole a few weeks ago and as I was eating it (and chocolate gravy), I was trying to think of a paleo breakfast casserole recipe. Thank you for not forcing me to think any longer. Rut? I see no rut. You’re doing a great job at keeping me fed. Perfect! I was wondering what to cook and there it is. Already have the yams, all the other stuff can be done and assembled during commercials of said baseball game. I actually got to go to two games of the series, so exciting! I appreciate your neutrality, it inspires me to be better behaved. I love my team, but don’t want to be a d**k about it. Can’t wait to see your secret project! and Go Boots! I made this today and it turned out really well! Thanks for an easy and delcious recipe!! Love you blog! I totally feel your lack of inspiration…I have Celiac and went Paleo (isn) 8 months agao and noticed drastic improvements in my athletic performance. I am trying to gain and bulk up a bit, which is hard when you have a naturally fast metabolism. I LOVE your blog and it has inspired me in so many ways so thank you! Bacon wrapped, in the slow cooker, bison meatloaf….a few secret ingredients in there…paleo bombed it all the way and demolished the entire thing (1/2 lb…was going to save it to have for leftover tomorrow night…not so much now haha) and that was WITH roasted kabocha squash and zucchini noodles… Anyways, I though I could inspire and challenge you to create a bomb-digity slow cooker meatloaf…. Hiya Julie! My name is Tia. I am a food lover and have a “unique” groove when I dance (so I have been told…you can read into that as you please ;) ) I went to cooking school and then had to change courses because I was diagnosed with Celiac Disease. I made the leap to following a Paleo (isn) diet and lifestyle about a year ago. I am trying to gain a bit and definitely add muscle. Your blog has inspired me in so many ways…for recipes, to workouts, and your beauty both inside and outside! I totally know your current lack of inspiration predicament..I cook for myself every day of the week, with maybe 1 night out per month (I am a student…limited budget). I made tonight the BEST meatloaf I have ever tasted, and my mom’s is pretty famous for being AH-mazing. I paleo bombed it and made a bacon wrapped slow cooker bison meatloaf. just a small dude (1/2 lb) that I was going to have over two nights, as I made some roasted squash and zoodles to go along with it. well, that ain’t gonna happen…because I ate the whole thing, it was that good! So I challenge you, in the hopes to inspire you, to a meatloaf cook-off! Only thing I ask is that it is slow-cooker friendly and no poultry (makes my tummy hurt). Can’t wait to see what you create and I hope you accept my challenge! Yummy!! I just made this for dinner love it!! Thanks for recipe. Five starts for sure. Made this last night for breakfast today and I seriously could’ve eaten the entire pan in one sitting. Such a delicious dish, and the best part is that it was so easy to make. Thanks for coming up with all of these incredible meals! Good luck with the Tour de Denver Restaurants! I love having a blogger/restaurant reviewer in my area! Can’t wait to hear about your yummy finds in Denver/Boulder! Is there really a Paleo restaurant in Boulder?? yes! blooming beets! and it was out of this world. seriously so freaking good! What brand of breakfast sausage do you use? ok so i’m not at all totally paleo but I do LOVE the recipes you post on here but I have a question…why do regular potatoes (russet, golden, etc) get such a bad rap? We love potatoes at my house and it isn’t like we add all the extra bad crap to them either, a little salt a little pepper dice them up and cook them in a little fat of your choice, deeeelish! But for some reason everyone thinks that regular/white potatoes are of the devil….I don’t get it. Thoughts? I love white potatoes and eat them regularly! Starchy food (including sweet potatoes) aren’t recommended for people who aren’t very active but I support them! What brand of sausage do you buy? The ground sausage at publix has crappy ingredients and I can’t find any at trader joes…is this something you can only find at Whole Foods? Juli – You have got to try Oak in Boulder! It’s not paleo, but their cabbage salad is paleo-ish, and their menu is amazing!!! Also, they have fresh donuts made in the morning!!! YOU MUST TRY!!! I know you’re very busy with everything going on, but maybe at some point you can put together a blog post about your favorite eats around Colorado? It’s always nice to try new places that are healthier and tasty! I support white potatoes too! Maybe some of the politicians can work THAT into their commercials! Lindsey! Hi! I’ve heard of Fresh Thymes! I’ll have to try it next time I’m up that way! Wait….help! Do you bake the diced potato and cook the sausage and onion before putting it in slow cooker? Thanks! Yes — you should brown the sausage first — don’t put it in raw. I’m considering taking my husband to CO for our anniversary just so I can try all the restaurants. Not lying. Hi! Love your blog and recipes! Do you know…if I cook this in a crockpot should I cook potatoes and sausage first?? Does anyone know how long cooked eggs can last in the fridge? How many eggs…I don’t see eggs listed. So good! Made it this morning and it was perfect! Made this Thursday night, and we absolutely LOVE it!!! Added a couple more veggies we had in the fridge. It’s so great having breakfast ready in the morning especially when time is such commodity between working out and getting ready for work. Thank you so much for posting this, it will now be a regular in our meal prep! Yum!! This looks delish! Will give it a try! what can I use instead of eggs. I have celiac disease, intolerant of eggs, gluten, soya, nuts, dairy, yeast. I want to go grain free for 2 weeks and looking for menus/recipes. Made this yesterday and it was delicious, especially topped with some hot sauce. I also have plenty of leftovers for quick breakfasts during the week; definitely going to become a staple in my house. Thanks Juli!!! So do you take the sausage out of the casings or do you just chop it up as is? I’m sure it works either way but I’m just curious. Thanks! I love this recipe. I had chorizo so I used that and added a couple more eggs. It was delish. Thanks Julie! So excited when I saw the recipe posted. Your initial showing of it looked delicious! I have it in the oven now! For dinner. ( ; There is nothing better than breakfast for dinner! Love your recipes. And your rants! They always have me in stitches!!! Do you use a certain kind of breakfast sausage? Do you peel the sweet potato? i didn’t but you can! This is the best thing ever. I made mine with venison sausage. This looks amazing. PS thanks for the Turkey Day ideas. We are doing Whole 30 at our gym and it ends two days before Thanksgiving. My goal for the group this week was for them to start thinking about how to paleo/primalize their holiday dinners. Great timing. I really loved this casserole and so did my husband; it is beautiful to look at as well as delicious! I am considering having it on hand for breakfast on Thanksgving and know my non-paleo extended family will be just as satisfied. 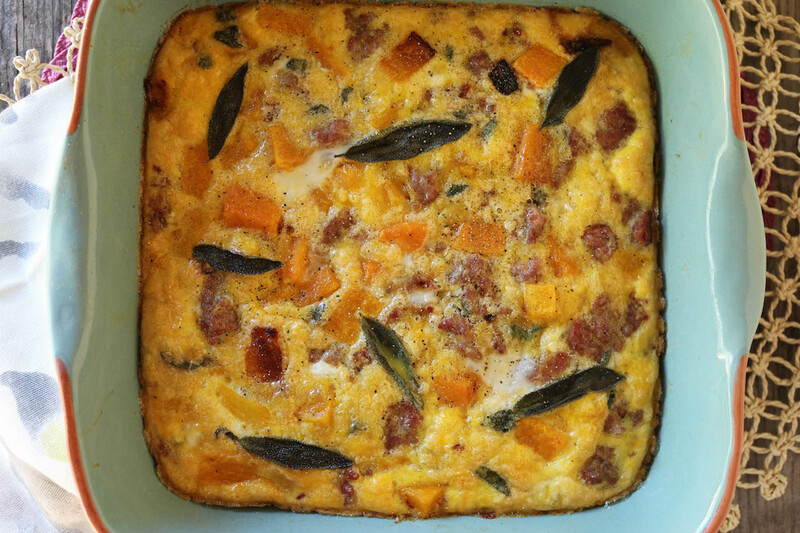 Would you please create a breakfast casserole using green chilis and a mexican taste profile? I would be forever grateful :) Thanks for all you do! How many eggs are needed to make this recipe? Complete winner. Every couple of days, I roast 4 or 5 sweet potatoes at a time and have them in the fridge. I can have this in the oven in no time! The whole roasted sweet potato is so much sweeter than diced and roasted I find so this has the savory and an awesome sweet note too. Topped with a bit of goat cheese! Made this once for the boyfriend & then again for a bunch of men at an office party – it was boy approved. Anything paleo that is boy approved is ten stars in my book. I also thoroughly enjoyed it! I am usually a lurker but I am so making this recipe for my husband. He has been buying not so healthy breakfasts at work lately. (frownie face) This looks so tasty and easy – I bet he will never buy those nasty breakfasts at work again…..until next month. Seriously, I can’t wait to try it. Will let you know. I made this last week to pack for lunches. Excellent! I’m going to make it again for Christmas morning breakfast. Made this morning and is by far my girlfriend and my favorite breakfast casserole ever. Used bacon and a whole yellow onion. Will be constantly made again thanks! Love it! Thank you! I made it with kale and mushrooms came out perfect! Hi there! Recipe looks amazing! I rebloged it and linked back to your page. Thanks for a great recipe. Brought this to a church breakfast and it was the first breakfast casserole gone. Awesome. Got rave reviews from my non paleo friends. Also wanated to add that I subbed butternut squash for the sweet potato for GAPS and it turned out perfect. Made this last night, it is amazing! 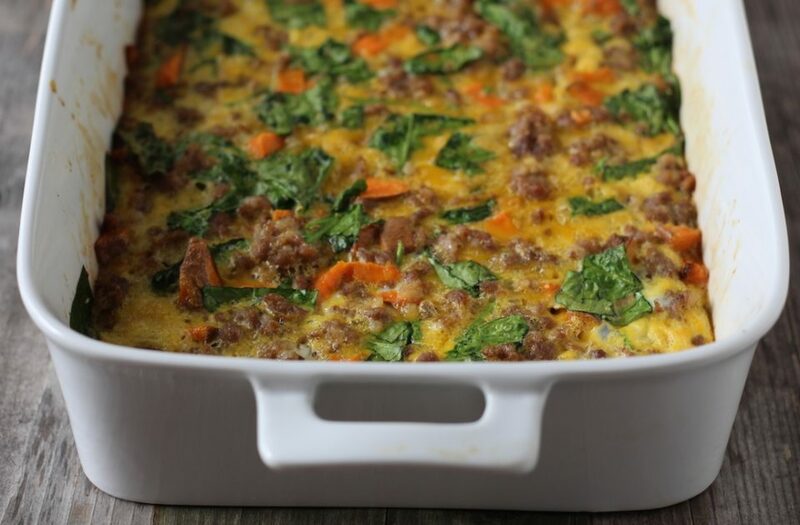 Thank you for a great easy breakfast casserole that brings a new flavor to the mornings. My hubby and I were both getting egged out, so I was happy that this wasn’t too eggy. Those of you making this the night before–do you mix it all up the night before and let it sit in the fridge before baking? Or just prep the sausage and sweet potato the night before and assemble in the morning? i want to do this for Christmas morning! What is the answer to this? Want to make nite before & cook in morn. My nephew has lost over 100 lbs by changing his diet to paleo and cycling like a madman, so for Christmas breakfast I made this for the family to honor his hard work and accomplishments. Even the non-paleo folks had seconds! It’s a delicious recipe. I doubled the sweet potatoes and onions and omitted the garlic powder and salt. I figured the sausage had enough spices, and it was perfect! I’ve made several different breakfast casseroles and this is by far my favorite. I thinking pre-cooking sweet potatoes was genius! woot woot!! glad to hear! I’ve been eating this all week for breakfast, and it’s so easy to make! Thanks Juli for the recipe, so delicious! This recipe is the bomb! We make it at least once a week with different veggies. This week we used Applegate Chicken and Apple Chicken Sausage and it was the best yet. Thanks for another awesome and easy recipe! Already making the second batch of this recipe in a week for the hubby and me. We are on day 10 of a whole 30 reset and your recipes have been so helpful!! Thanks!! Fab, just fab! Used island fresh wild boar sausage and doubled up everything, amaze balls!!! Mahalo Nui Loa for so many GREAT recipes!!! Juli, this was amazing!! I substituted chorizo for breakfast sausage and it was incredible. Had never cooked with chorizo before, but that’s sure gonna change from now on!! Sooo good. I was having 3 friends over for breakfast and they all raved over it and asked for the recipe. Two thumbs up, thank you!!! Umm YUM! This is very good! This recipe is so amazing! Thank you, thank you! I just subbed the spinach for kale and sausage for ground lean turkey and it still turned out fantastic! Both the turkey and kale were cheaper, so perfect for my college kid budget! Recipe was easy to make and perfect for a paleo college student like myself! I don’t have sweet potatoes but I have regular red skin ones at home.. Could I use them for this recipe? Would anything change (cooking time)? Thanks in advance ! Made this last week. Didn’t have spinach so used asparagus, 8 eggs, and only 1 pound of spicy sausage, still came out really good. Even my husband who is trying to get used to my new Paleo lifestyle and my numerous recipe trials liked it. 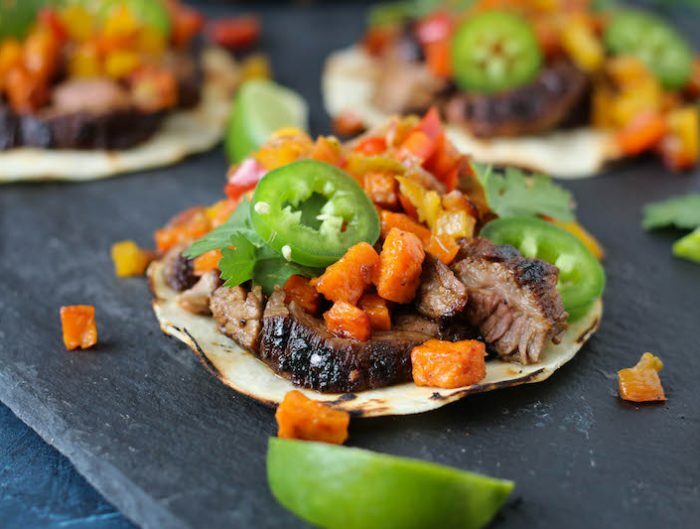 This is an awesome recipe, could anyone give the calorie count? I can’t give you the calorie count for the actual recipe unfortunately, but can break down the version I make. This is a ratio of about 44% fat, 11% carbs, and 45% protein. Note that almost all of the fat comes from the eggs and coconut oil. Obviously this isn’t an exact science and a lot of it will have to do with what a “medium” onion or “large” sweet potato is to you and your market. But it should be close enough. This was great! Only change I made was sub kale for spinach and it was wonderful! Made it to bring to a group dinner and no one missed the cheese, milk or bread that is normally in an egg casserole. Very flavorful. Been making this for about two weeks now with the shredded sweet potato option. It turned out amazing. I also used 1.25lbs of 99% ground turkey seasoned to taste like sausage instead of 1.5lbs of ground breakfast sausage. I like to put some guacamole over the top when eating. 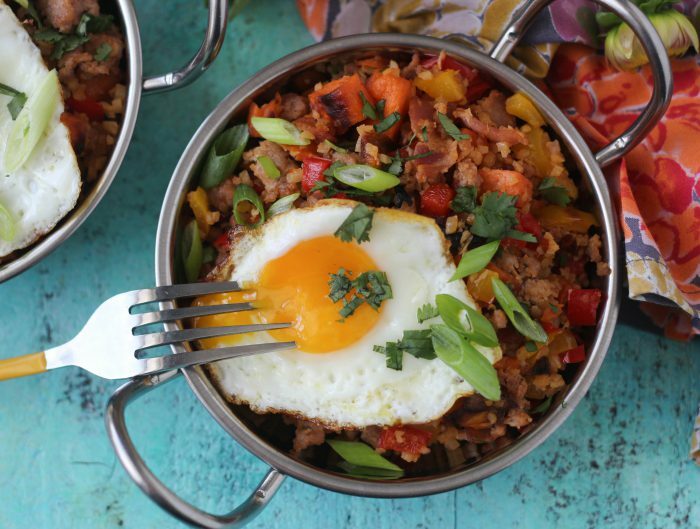 As someone who hates mornings this is a great grab and re-heat recipe. I definitely recommend trying it! Thinking about doubling this recipe and freezing one…any idea if this freezes well? This is great! Made it this morning, added peppers, mushrooms and sharp cheddar. Thanks for another awesome breakfast idea! This is one of my go-to recipes and it helped me survive my first Whole30! I included in my post today http://www.madeitloveitpaleo.com/2015/07/02/recipe-roundup-paleo-breakfast/. Thank you for such a wonderful recipe!!! I love this recipe! Just wanted to thank you thank you THANK YOU for sharing so many amazing recipes! Another “go to” for me is your spaghetti squash casserole. yay glad you have a few go-to recipes on my site! I made this recipe yesterday for my small group! It was awesome!!! Everyone loved it and of course asked for the recipe! I baked it about 15 minutes in the oven and took it to my small group (at another members house) and finished it the oven there for about 10 minutes! It was perfect! I love all your recipes! Thank you for all that you do! Love this recipe! I used smoked deer sausage, organic diced sweet potatoes, spinach, and egg whites. I didn’t have to bake the sweet potato. Once the sausage was brown, I tossed the sweet potatoes in the same pan to coat with the fat and it turned out great! I plan on using this recipe to meal prep breakfast or make “muffins” for on the go meals. Do you think it will work this way? This looks awesome! I want to make this for Xmas morning but want to make it ahead of time. Can I make it in advance and freeze it? Made this for Christmas brunch and it came out brilliantly. Not a single bite was left. I quasi-doubled the recipe, put everything together but the eggs the night before, refrigerated it, then in the morning I added the eggs (which I had pre-whisked into another container with a lid and refrigerated). When I got back from Christmas morning Mass I just poured the eggs over the top and popped it into the hot oven. 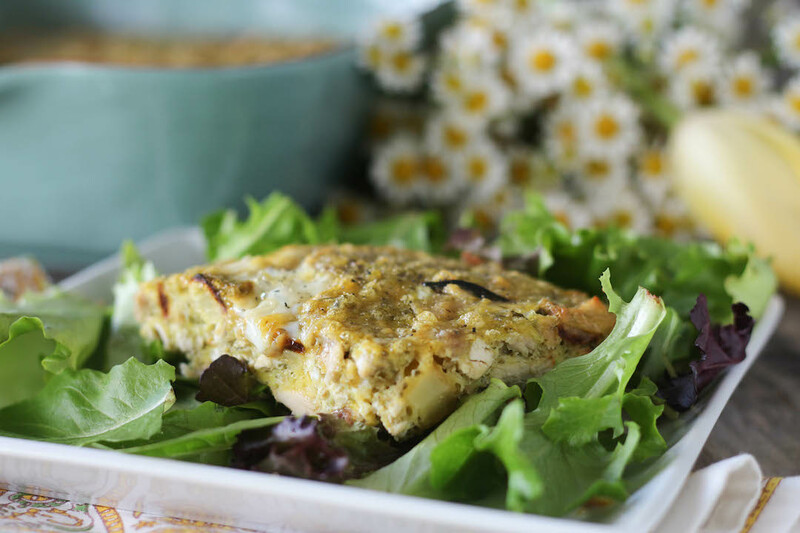 This is a great alternative to our pre-paleo lifestyle brunch strata. Thanks, Juli! This casserole was incredible! Thanks for sharing! glad you liked it, Jason! Can I put this together the night before, and then bake it in the morning? Thank you for all that you do! I made this a couple of weeks ago and it was SO GOOD. I love the flavor combo.. it makes a ton of food too so you will have leftovers. Definitely a must try! lol that’s awesome!! glad you loved it!! I just have to say that I first made this when I did my first stint at Paleo for our gym nutrition challenge. That was more than two years ago. I tasted it and was amazed that something with just pure ingredients could be so sweet and savory at the same time. It literally was the one thing that made eating paleo a sinch. I also thought all egg bakes were probably just as good – WRONG. I make this for our breakfast potlucks at work, when friends come in town and usually on a weekly basis for myself in the mornings and it never gets old. Literally everyone loves it!! I took a risk and made this for an office party! Everyone loved it and asked for recipe, so that’s about as good as you can get! I used coconut oil on the potatoes and Jenny-O turkey breakfast sausage. I cut the spinach in half because it looked like a salad on top :). This is a great twist for a breakfast casserole, and I will definitely add it to my normal rotations. Thank you so much for sharing it!!!! I just made this with a couple changes and it was terrific! I used 1/2 ground pork and 1/2 ground turkey, added tbl. Oregano, some bell pepper and substituted 3 quartered and sliced zucchini instead of sweet potato. I am on a strict diet and this made my diet extremely satisfying with only 325 calories per serving. Thanks! This is a great, easy and tweak-able recipe! I was out of spinach so I incorporated a bunch of zucchini ribbons into the meat/onion mixture…and instead of dicing the sweet potatoes, I sliced them into thin rounds and baked them, then layered them across the top with a little grass fed cheese. Yum! We’ll be whipping this up (or a variation of it!) regularly. I make this recipe a LOT. I use the sweet potatoes, diced ham, red onion, broccoli and yes a little cheese mixed in. I do have a question though – could you make it up the night before and bake it in the morning or best to do all at once? If y’all are worried about sausage make your own with ground pork or turkey or use ground beef….put in the spices you like( fennel seeds a must) and make a bunch at once to freeze extra. So much better to have control over what you eat then to buy it, no? So easy. So delicious. So many leftovers! I made this on Saturday and am still eating it today. Usually I get annoyed with or sick of leftovers. I have had no problem eating this reheated every day for breakfast. YUM!! Seems like a recipe that you can add different veggies to as well and it will taste just as good (I credit in part to the coconut oil that I use). Just YUM! OMG!! I have found my new favorite. It’s hard to find one this healthy!! Made this bad boy Easter morning while company was in… It was a hit for sure! Making this again soon. Did had some left over, and froze it. Will try it, but feel quite sure it will be as good as if just made! I think the coconut oil just sets this thing off!!!! Oh man, I wish I had some right NOW!!! This recipe was sooo good!! My family and I very much enjoyed. Thank you!! so glad you liked it, jeanna! Can you freeze this and reheat later? Like cook r entirely and then freeze and reheat when needed? i haven’t found that eggs freeze and reheat well so i don’t do it myself, but you can try it! This is soooo good! I added a half bell pepper bc I didn’t have much onion, and it was AMAZING! Will definitely make again.